Since launching in 2003, Holiday Taxis has helped tens of millions of passengers reach their destination. Holiday Taxis knows that after the end of a long flight, the last thing you want is to have to faff around at the airport trying to sort out the last leg of your journey. With services available in over 130 countries worldwide, from Fiji to Finland and from Bali to Belgium, forget the stress, let Holiday Taxis take care of your airport transfer. Offering a huge number of services to suit all your needs, with everything from private cars to minibuses, coaches and limousines, Holiday Taxis strives to help you kick off your holiday with the hassle. For the thrill-seekers, they even offer an exhilarating helicopter transfer, and for those passengers arriving in Venice, Holiday Taxis can sail you to your hotel along the canals in a wonderful water taxis. Whether you’re planning a weekend city break, a chance to soak up some sun, or even the adventure of a lifetime, start and end your holiday with Holiday Taxis. 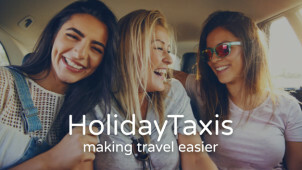 How do I use my Holiday Taxis discount code? Have a look at Holiday Taxis’ fantastic Tailor Made service, where you can customise their services to meet your exact requirements. Do Holiday Taxis offer transfers for wheelchair users? Most of Holiday Taxis' suppliers offer this service, however some are unable to, so simply check with Holiday Taxis’ Tailor Made team to make sure. Do Holiday Taxis offer services for large tours? Holiday Taxis is happy to help organise tours and large itinerary bookings, you just need to get in touch to discuss it with them. Where do Holiday Taxis operate? Holiday Taxis services a vast number of destinations across Europe, Africa, Asia, the Middle East, Oceania and America. Is a service charge included in Holiday Taxis’ price? Your final price doesn’t include gratuities. This will be at your discretion, excluding services in Florida and New York, where the tip will be included in the final price. Holiday Taxis operates services 24 hours a day at the majority of their airport destinations. Holiday Taxis is the first and last word on airport travel, with transport solutions in over 12,000 cities and resorts across more than 130 countries the world over. When you need to get to the airport, why look anywhere other than the best? Using a Holiday Taxis discount code will save you money for the bits of your holiday that really matter. Get your time away off to a great start with Holiday Taxis. Holiday Taxis offers a huge range of options for your airport transfer, from private cars to coaches to minibuses. They even offer a limousine service, enjoy it all with your Holiday Taxi discount codes! Holiday Taxis has helped tens of millions of holidaymakers get their holidays off to a good start. Flights can be stressful, but with Holiday Taxis your journey to the airport doesn’t have to be! Once you’re off the plane, Holiday Taxis can help you get from the airport to your destination with zero hassle. Road travel is so last year. If you’re heading to Venice, try out one of Holiday Taxis' amazing boat transfers, and experience the city’s famous canal system for yourself. With a Holiday Taxis promo code you can make traffic jams a thing of the past. If you’re feeling adventurous, why not try one of Holiday Taxis’ premium helicopter transfers? Forget the highway, try the sky-way. Available across a number of worldwide destinations, this will be an unforgettable start to your holiday.